Two cosmonauts, Fyodor Yurchikhin and Alexander Misurkin, set a new record for the longest Russian spacewalk August 16, spending a total of seven hours and 29 minutes outside the International Space Station. The cosmonauts installed power and data cables for a new Russian laboratory module expected to launch to the space station in coming months, NASA said. The space agency’s cameras beamed images of the record-setting spacewalk to Earth. NASA spokesman Rob Navias said the cosmonauts broke a 23-year-old Russian spacewalking record. Before August 16, the longest spacewalk by two Russian cosmonauts was seven hours and 16 minutes on July, 17 1990, by cosmonauts Anatoly Solovyev and Alekandr Balandin to repair thermal protection gear on Russia’s Mir Space Station. The longest spacewalk in history, eight hours and 56 minutes, was performed by NASA astronauts Jim Voss and Susan Helms on March 11, 2001, as they worked on the space station. Russian cosmonaut Alexei Leonov was the first spacewalker on March 18, 1965. 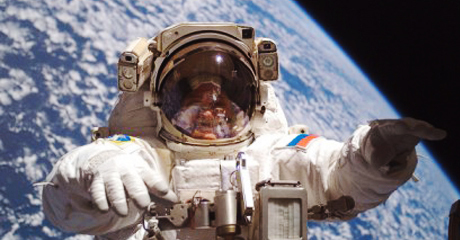 That spacewalk for the former Soviet Union lasted just 12 minutes. In the image above from video made available by NASA, Yurchikhin works outside the space station during the record-breaking spacewalk. Five space agencies — from Canada, Europe, Japan, Russia and the United States — are working together on the International Space Station.